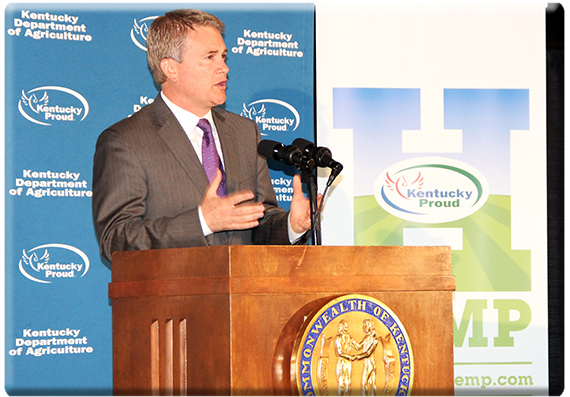 LEXINGTON, Ky. – Kentucky Agriculture Commissioner James Comer joined farmers and industry leaders Tuesday to lay out an ambitious agenda of industrial hemp research projects and economic development initiatives in Kentucky in 2015. Commissioner Comer announced that the Kentucky Department of Agriculture, which administers the industrial hemp program in Kentucky, approved 121 applications for hemp pilot projects, including universities, growers, and processors. The approved projects total 1,724.25 acres to be planted. Following the event, the department was informed that the U.S. Drug Enforcement Administration approved KDA’s permits to import seed. Many speakers credited Commissioner Comer and the KDA with working to bring industrial hemp production back to Kentucky after almost 70 years. “By believing in and fighting for Kentucky farmers, Commissioner Comer has created an opportunity for farmers, industries, and communities to work together, build infrastructure, and grow jobs, and it’s been my honor to be a part of that,” said Mike Lewis, a Rockcastle County farmer, founding member of Homegrown By Heroes, director of Growing Warriors, and chief operating officer of Freedom Seed and Feed. Before and after the event, Lewis and other Freedom Feed and Seed staff demonstrated hemp processing with an old-fashioned hand brake. The hemp that was processed Tuesday will be used to make American flags later this year. Mark Rosenfeld, CEO of ISA Scientific, a Utah company that develops cannabinoid-based health products, said ISA will work with GenCanna to develop medicinal products derived from industrial hemp. “I am very pleased to return to the Bluegrass State for such important work, and I’m honored and eager to commence collaborative work with colleagues at the University of Kentucky,” said Perry Fine, ISA Scientific’s medical director and a Kentucky native whose father was on the faculty at the opening of the UK Chandler Medical Center. Fine said chronic pain and diabetes will be the first targets of clinical trials. Andy Graves, CEO of Atalo Holdings, a holding company for three hemp businesses, said Atalo has the largest hemp grower group in Kentucky with 30 growers in 12 counties planting 545 acres. Graves said Atalo and GenCanna are working together to create a hemp “campus” at the old F.W. Rickard seed facility in Winchester. The industrial hemp pilot projects are intended to generate data on production methods, seed varieties, harvesting and processing techniques, and uses for harvested hemp. The first pilot projects in 2014 were conducted by seven universities and 14 individual farmers under the supervision of the KDA. The projects investigated the production of more than 35 varieties of hemp on just over 30 acres. Commissioner Comer has championed the cause of restoring industrial hemp production to Kentucky since he took office in January 2012. With bipartisan support, Commissioner Comer led the successful effort to pass a state law creating a regulatory framework for hemp production in Kentucky. A provision of the federal farm bill that was signed into law more than a year ago authorizes hemp pilot programs in states such as Kentucky where hemp production is legal under state law. Kentucky's first hemp crop was grown in 1775, and Kentucky went on to become the nation's leading hemp-producing state in the mid-19th century with peak production of 40,000 tons in 1850. U.S. hemp production declined after the Civil War, and almost all of the nation's hemp was grown in the Bluegrass region of Kentucky. Federal legislation passed in 1938 outlawed production of cannabis, including hemp, in the U.S. Hemp production in Kentucky and the U.S. ramped up during World War II as part of the war effort but fell again after the war and ended with the demise of a small hemp fiber industry in Wisconsin in 1958. For more information on industrial hemp, the pilot projects, and hemp’s history in Kentucky, go to www.kyagr.com/hemp.